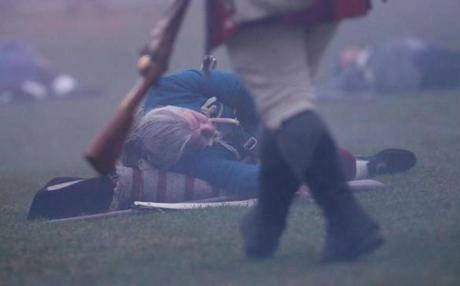 Lexington Militia lay dead and wounded on the ground as The King’s Regulars fire their muskets as reenactors depict the skirmish that took place on Lexington Common. 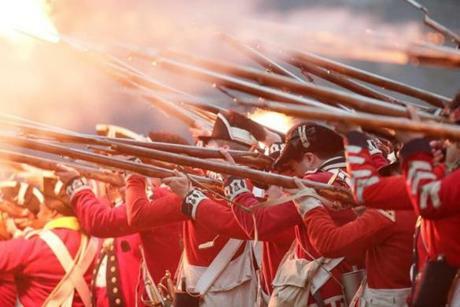 We know how this story turns out, but it’s still fun to watch 244 years later. 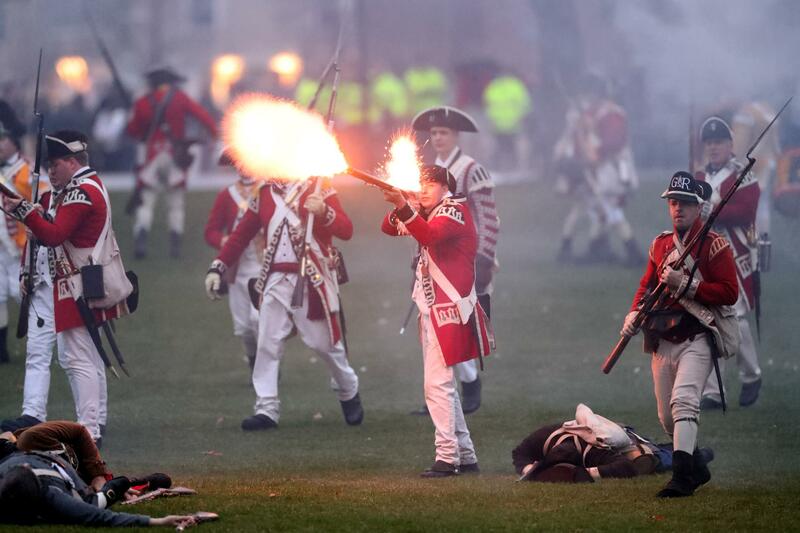 Hundreds of spectators braved a drizzle on Lexington Green on Monday morning to witness the annual Patriots Day reenactment of “the shot heard round the world,’’ the first major conflict of the Revolutionary War. 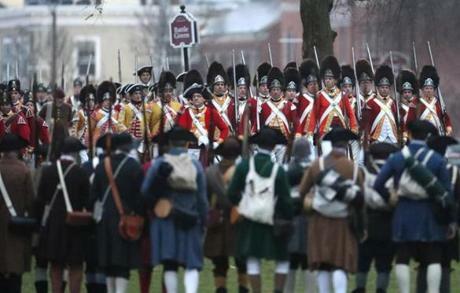 Just after dawn, the British regulars appeared, decked in Lobster red. Rank after rank marched onto the Common. 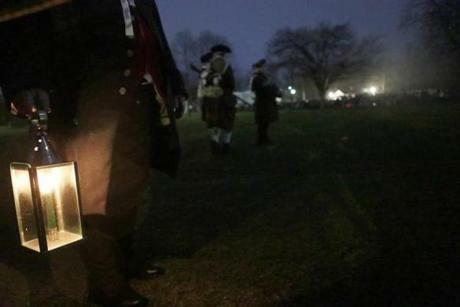 Captain John Parker, who led the colonial militia, bellowed: “Steady, men!” There followed a shot of unknown provenance, followed by a barrage of musket fire that left eight Massachusetts men dead. 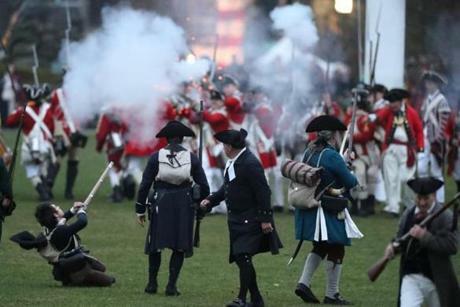 A sea of fire as British Revolutionary War reenactors fire one last round after the Battle on Lexington Green. 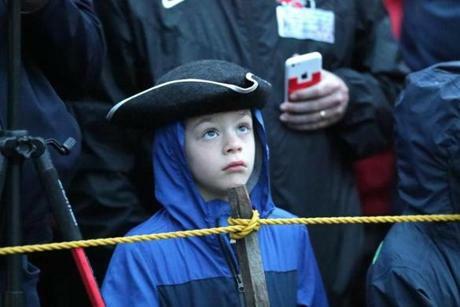 Aidan Davis, 7, of East Longmeadow wore his tricorn hat as he took in his first reenactment of the Battle of Lexington. Lexington Minute Men patrolled Lexington's Green. 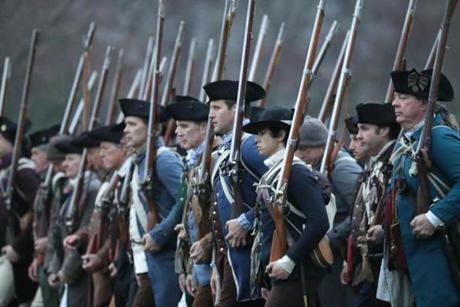 Lexington Militia came under fire by The King’s Regulars. British soldiers walked past the Lexington dead and wounded. Lexington Milita confront The King’s Regulars. 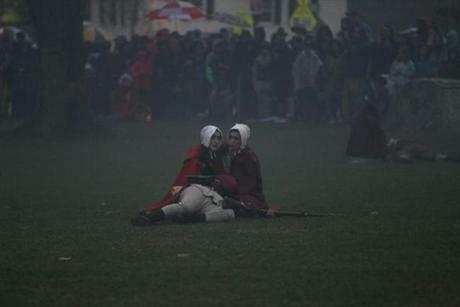 Women tended to the wounded. 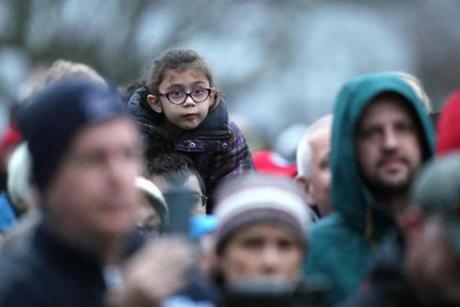 Spectators gathered pre-dawn to watch the Lexington Militia confront The King’s Regulars.